Nothing but the best in this luxury home. Kitchen and baths redone in top-of-the-line finishes. High-end furnishings and bedding, fully-stocked and enlarged kitchen allows you to prepare family meals, or walk to the many great restaurants in Avon. The bedrooms feature a king bedroom downstairs and two queen/queen bedrooms upstairs. All bedrooms have private baths. The bedding is luxurious and cozy. 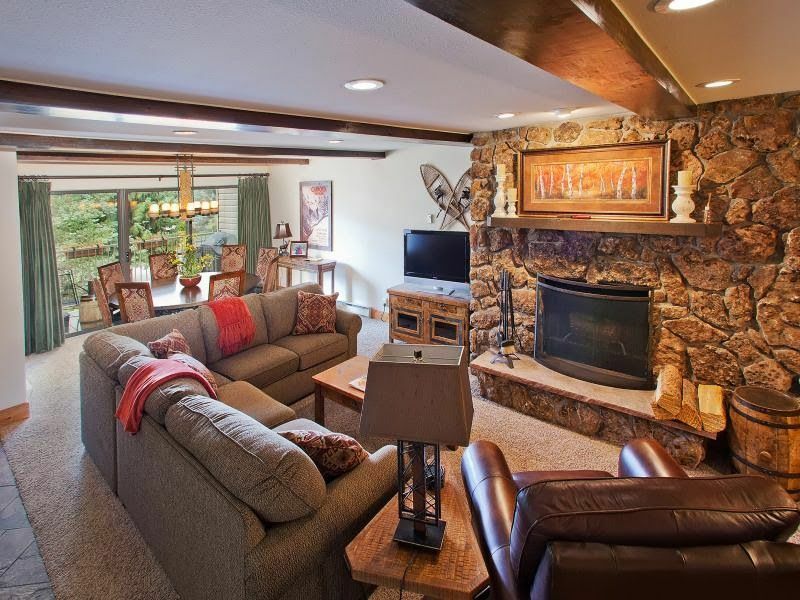 This condo is large - 1920 square feet (2nd floor-NO elevator) with two floors and is located at the base of Beaver Creek Ski Resort in the charming town of Avon. A walk-out balcony provides breathtaking views of Beaver Creek and Bachelor Gulch Ski Mountains, and a gas grill allows you to cook while you take in the view. The Condominium is perfect for one or multiple families and large groups. The onsite management company provides check-in, linens, firewood, maid service and on-call maintenance. The condo community has a heated swimming pool, three hot tubs, a sauna, and tennis courts. The free private shuttle bus service takes you directly to Beaver Creek Rivercreek Gondola and Vail Lionshead to make your ski trip easier and more convenient. The community is one of the few adjacent to the beautiful Nottingham Lake and Park with its jogging/walking/biking trail which provide outdoor activities winter and summer. The Condo is within walking distance to absolutely everything in Avon. The city of Avon boasts many restaurants and bars, shopping, groceries, spas and beauty salons. The indoor Rec Center is steps away, offering workout facilities, group exercise classes, a lap pool, and a heated water park. The full-service library is right next door. Avon provides free bus service throughout the town and a bus stop is located right outside the property. The town of Vail and its ski area are an easy ten minute drive, or use the free shuttle on the property! We're obviously excited about the Condo, the community and the town. Everything you need to have a fabulous vacation is right here at our front door. We hope you'll accept our invitation to share our mountain retreat. The Seaman Family began coming to the Vail Valley in 1970 and has owned several properties during that time. We are now bringing the 4th generation to what we think is one of the most beautiful places in the world. Our family is excited about the new condo located here in Avon which is so close to everything. The former owners were from Texas and so are we. We hope to continue the Texas hospitality! Large comfortable couch with sleeper. Dishes, silverware, glassware--place settings for 12. Full set of pots and pans, cookie sheets, pizza pan, crock pot, electric griddle, electric hand mixer and many cooking utensils provided. Granite counter tops, stainless steel appliances, slate floors, breakfast bar with seating for 3. Large flat screen in Living, flat screen tvs in each bedroom. Off of dining area with views to the mountains. Dry sauna in pool area. Outdoor heated pool in condo complex. Three hot tubs on condo property. Amazing weekend at this condo! We had a group of 8 and this fit us perfectly! And everything was seamless - appliances were modern, beds and linens were comfortable, location was PERFECT! We couldn't have asked for a better weekend! Thank you! Jamie, I'm so glad you enjoyed your weekend at my condo. We just returned from our ski trip there and we always enjoy our home away from home. It is always a comfortable place to relax, enjoy the beauty of the mountains, and of course, the skiing couldn't be better. I hope you come again! Perfect for our group of 8! Great property - checks all the boxes. Three bedrooms, one on bottom floor. Amazing fireplace. Patio with fire wood. Amazing location. Hard pressed to find something wrong. Thanks so much for an amazing stay! We stayed at this condo in February 2019 to ski at Beaver Creek and Vail, and it was perfect! Vail is a quick drive down I-70, and the condo runs a shuttle to Beaver Creek every 10-15 minutes (or you can walk---it's less than 1/2 mile to the gondola). There's also a shuttle to Vail on the weekends---but who wants to ski on the weekend? The condo is spacious, comfortable, and well-appointed. As you can see from the photos, there is a master bedroom on the lower floor with a king-sized bed and attached bath. Upstairs, there are two bedrooms, each with an attached bath. One has two queen-sized beds, and the other has two queen-sized beds and a futon. I also understand that the very comfortable sectional sofa has a pull-out bed, but we didn't use it. Though the condo is very big (the upstairs bedrooms are huge), I'm not sure I'd try to cram 12 adults in here. Six adults and a couple of young kids would probably be just fine, though. Check-in at the management office was a breeze. We had no problem finding parking right outside for 3 vehicles. This unit was wonderful for three families. We were all able to relax and spread out without stepping on each other's toes. The unit is wonderfully and comfortably furnished and we didn't need for anything. We would definitely rent again in the future! Great Stay for 4 adults & 4 kids! We had a wonderful time at this Condo. Stairs were not a concern for our little ones. Location is great for access to the Interstate and other destinations in the area. Staying here makes us want to come back to the Avon/Beaver Creek/Vail area again! I am glad you enjoyed your stay at our condo. It's location is why we chose to buy here, it is so close to everything fun for our family or a short drive away. Please come again! Our overall experience was great. The condo is very clean and very nice. We had easy access to Beaver Creek. We were there for the Xterra race. This place was so convenient. The swim portion of the race was within walking distance. Everything related to the condo was great and we were very happy. We had an issue with the neighbors. It seems that they had too much to drink and decided to throw glasses in the front yard. Our vehicle was parked in front of the condos and the windshield was hit. I reported this to the owner. I also called the office. The owner was very concerned and asked me to report it to the office and to file a police report. We were in such a hurry to get back that we did not have time to stop at the police station. My only negative thing to say was that when I reported it to the office they did not seem to be concerned. I would have expected some one to take my name or phone number. I figured they would check it out. I don't know that they checked. I understand that this is not the owners fault and she was extremely nice and concerned about our issue. So having to drive back with a cracked windshield was not fun. Especially since the crack kept getting bigger. Again I am very sorry that this happened. It is a shame that some people don't have respect for others' properties. I am very thankful that this is a very rare occurrence. I will follow up with the office on this issue. I hope that you will consider staying with us again next year for the Xterra race. Snow shoeing, art festivals, music festivals, camping, Colorado Ski Museum--Vail, Walking Mountain Science Center--Avon, Vilar Performing Art Center-Beaver Creek, Betty Ford Alpine Gardens--Vail (spring & summer).